The aim of this study was to investigate the presence of L1 cell adhesion molecule (L1CAM) in the serum and tissue of patients with hepatocellular carcinoma (HCC) and determine its efficacy in the detection of early HCC. HCC meets the criteria of a tumor that would benefit from a surveillance program, but the poor sensitivity and specificity of currently available tools have prevented the widespread implementation of surveillance. This study included 105 patients from Menoufia University Hospitals and National Liver Institute. They were classified into four groups: group I, the healthy control group (15 individuals); group II, which included patients with hepatitis C-related liver cirrhosis (45 patients); group III, which included patients with early HCC (25 patients); and group IV, which included patients with advanced HCC (20 patients). All patients were subjected to thorough history taking, complete physical examination, liver function tests, serum α-fetoprotein evaluation, and serum L1CAM evaluation. Two biopsies were obtained from each patient in group III, one from neoplastic tissue and another one from adjacent cirrhotic tissue to detect the expression of L1CAM by immunohistochemistry. The mean serum L1CAM level was highly significantly higher in both the early and advanced HCC groups than in all subgroups of liver cirrhosis. The expression of L1CAM was highly significantly higher in tumor tissues than in adjacent cirrhotic tissues. This study suggests that L1CAM is accurate in differentiating patients with HCC even in early stage from those with nonmalignant chronic liver disease. Hepatocellular carcinoma (HCC) is thought to account for more than 5% of all cancers and for 80–90% of primary liver cancer . Each year, HCC is diagnosed in more than half a million people worldwide ,. Most of the burden of the disease (85%) is in developing countries, with the highest incidence rates reported in regions where infection with hepatitis B virus is endemic: Southeast Asia and sub-Saharan Africa . In Egypt, HCC is the second most common cancer in men and the sixth most common cancer in women. Hospital-based studies from Egypt have reported an overall increase in the relative frequency of all liver-related cancers in Egypt, from ∼4% in 1993 to 7.3% in 2003 ,. Known major risk factors for HCC are liver cirrhosis, viral infection (chronic hepatitis B and hepatitis C), toxin (aflatoxins and alcohol), metabolic disorders (diabetes mellitus, nonalcoholic fatty liver disease, and hereditary hemochromatosis), and immune-related disorders (primary biliary cirrhosis and autoimmune hepatitis) . In Egypt, hepatitis C virus (HCV) is the main risk factor for HCC. Baghdady et al. reported that HCV-positive patients constituted 70% of the total number of HCC cases, whereas hepatitis B virus-positive cases constituted 18%. Patients with cirrhosis are at a greatest risk for the development of HCC and should undergo semiannual surveillance using ultrasound, with or without α-fetoprotein (AFP). Patients with positive surveillance testing should undergo contrast-enhanced MRI or four-phase computer tomography for diagnostic evaluation . L1 cell adhesion molecule (L1CAM), a member of the immunoglobulin superfamily of cell adhesion molecules, is a transmembrane glycoprotein composed of six Ig-like domains and five fibronectin type III repeats, followed by a transmembrane region and a highly conserved cytoplasmic tail . Under the physiological condition, L1CAM is originally found in the nervous system and is expressed in developing neuronal cells, hematopoietic cells, renal epithelial cells, endothelial cells, and intestinal crypt cells . Growing evidence shows the abnormal expression pattern of L1CAM in a variety of cancer types, including glioma, neuroblastoma, non-small-cell lung cancer, gastric cancer, pancreatic cancer, colorectal cancer, ovarian cancer, and endometrial cancer. Moreover, the presence of L1CAM overexpression has been indicated to be associated with advanced cancer progression and poor patient prognosis. These findings imply the central role of L1CAM in human carcinogenesis . This study included 105 patients between 28 and 71 years of age from inpatient wards and outpatient clinics at Menoufia University Hospitals and National Liver Institute from November 2013 to December 2015 after approval of the Ethical Committee of Faculty of Medicine, Menoufia University. They were classified into four groups. Group I included healthy controls (15 individuals). 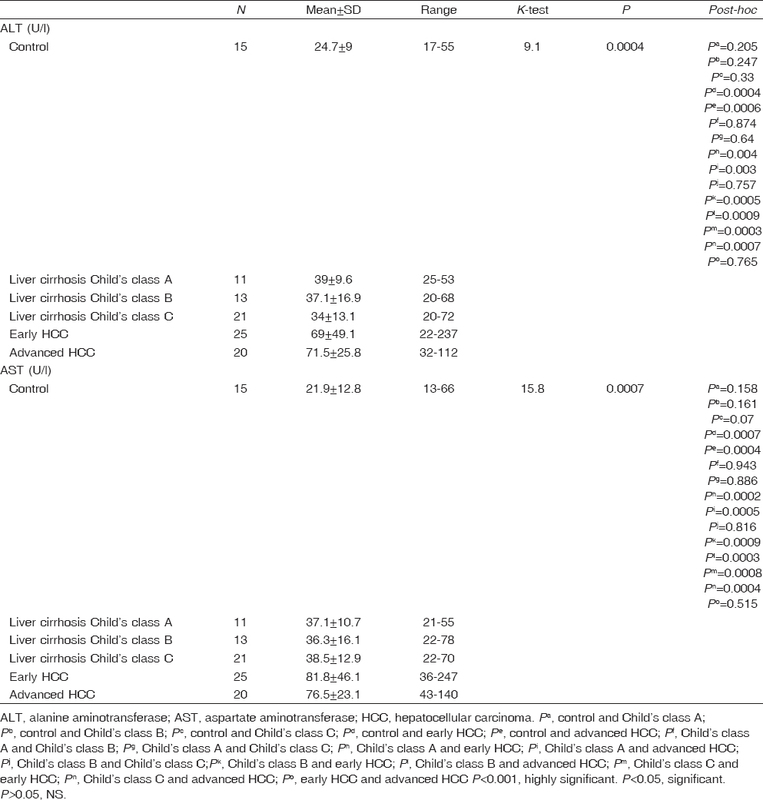 Group II included patients with HCV-related liver cirrhosis (45 patients) who were classified into three subgroups according to Child's classification; 11 patients with Child class A, 12 patients with Child class B, and 13 patients with Child–Pugh class C. Group III included patients with early HCC who underwent curative surgical resection (25 patients), and group IV included patients with advanced HCC (20 patients). All participants underwent full history taking and clinical examination, with emphasis on the symptoms and signs of liver cirrhosis and HCC. All groups were subjected to the evaluation of alanine aminotransferase (ALT), aspartate aminotransferase (AST), serum bilirubin and albumin (all were performed on Beckman Synchron Beckman Coulter (UK) Ltd, United Kingdom, CX9 ALX Autoanalyser; Beckman Coulter Inc., Brea, California, USA), prothrombin time (measured using the coagulation method on fibrin timer; Marburg, Germany), and serum AFP and L1CAM evaluation (using the ELISA technique). Blood was collected by means of venipuncture, allowed to coagulate at room temperature for 10–20 min, and then centrifuged at the speed of 2000–3000 rpm for 20 min to collect supernatant. A commercially available kit (L1CAM ELISA Kit, BYEK2144; Chongqing Biospes Co. Ltd, Jiangbei, Chongqing, China) was used for four groups according to the method described by Kenwrick et al. .
Abdominal ultrasound was performed for all groups, and triphasic computer tomography of the abdomen was performed for groups III and IV. Two biopsies were taken from each patient in group III, one from neoplastic liver tissue and another one from adjacent non-neoplastic tissue. All biopsies were processed in the Pathology Department, Faculty of Medicine, Menoufia University, where the samples were fixed in 10% neutral-buffered formalin, dehydrated in ascending grades of ethanol, followed by immersion in xylene, and then impregnated in paraffin. The method used for immunostaining was the streptavidin–biotin amplified system. 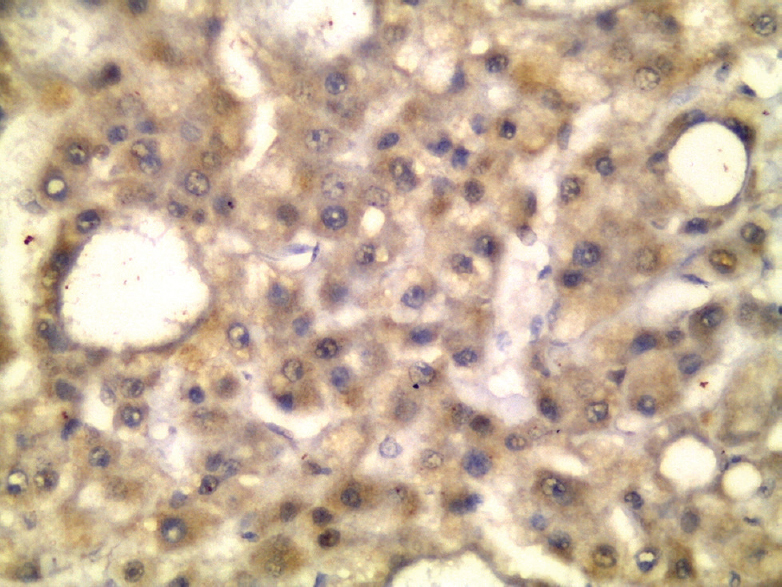 The primary antibody was rabbit polyclonal antibody raised against L1CAM. It was received as 100 μl concentrate and diluted with PBS at a dilution 1:250 (GeneTex International Corporation (Global), GeneTex Inc.; cat. no. GTX129010, Hsinchu City, Taiwan, ROC), with human brain tissue as a positive control. 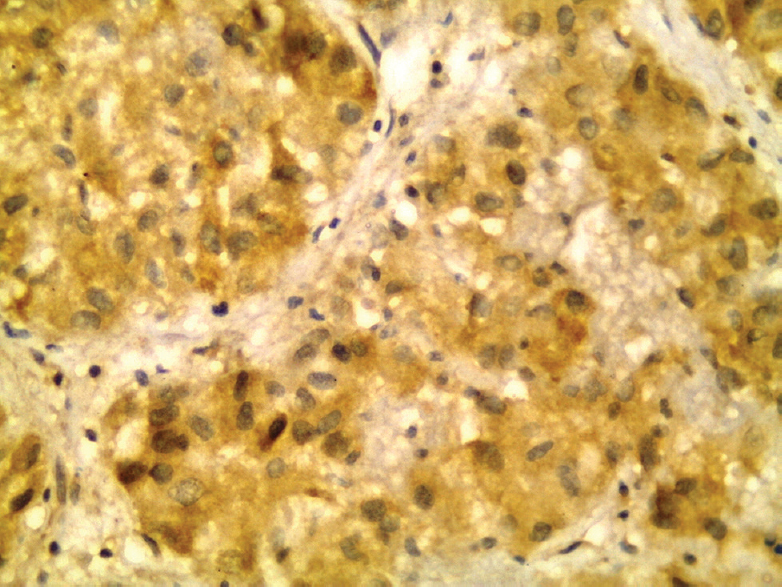 L1CAM expression was considered positive when 5% or more of the cells showed cytoplasmic or membranocytoplasmic brown staining . H-score was applied to evaluate the studied cases according to Bilalovic et al. in which both the intensity (scored from 1 to 3, with 1 = mild, 2 = moderate, and 3 = strong) and the percentage of positive cells were considered. The intensity score was then multiplied by the percentage of cells that stain with each level of intensity, and the sum of these mathematical products is expressed as H-score. H-score = strong intensity (3)×percentage + moderate intensity (2)×percentage + mild intensity (1)×percentage. The statistical package for the social sciences (SPSS, version 20; SPSS Inc., Chicago, Illinois, USA) software computer program was used for analysis of our data. Data were expressed into two phases. The results were presented as mean value and SD for quantitative data and as frequency and percentage for qualitative data. t-Test was used for comparison of two independent normally distributed quantitative variables. The Mann–Whitney U-test) was used for comparison of more than two independent quantitative variables not normally distributed. The K-test (Kruskal–Wallis) was used for comparison of two independent quantitative variables not normally distributed. The χ2-test was used for comparison between two or more independent normally distributed qualitative variables. The Fisher exact test was used for comparison between two independent qualitative variables with one cell less than 5. The Pearson correlation coefficient (r) was used for comparison between two dependent quantitative normally distributed variables. The significance level (P value) was expressed as follows: P value 0.05 or more was nonsignificant; P value less than 0.05 was significant; and P value less than 0.001 was highly significant. This study included 105 participants from inpatient wards and outpatient clinics at Menuofia University Hospitals and National Liver Institute from November 2013 to December 2015. The mean ages of the studied groups [Table 1] were as follows: 31.2 ± 2.7 years in the control group, 58.7 ± 6.2 years in the liver cirrhosis group, 52.8 ± 5.4 years in the early HCC group, and 59.4 ± 5.1 years in the advanced HCC group. These results showed that the mean age was significantly higher in the liver cirrhosis group and the advanced HCC group than in the early HCC group. There was no significant difference between the advanced HCC group and the liver cirrhosis group as regards age [Table 1]. The liver cirrhosis group included 32 (71.1%) male and 13 (28.9%) female patients, the early HCC group included 20 (80%) male and 5 (20%) female patients, and the advanced HCC group included 15 (75%) male and 5 (25%) female patients. These results showed that liver cirrhosis and HCC are highly prevalent in male population. The mean serum ALT in the studied groups was as follows: 24.7 ± 9 U/l in the control group, 39 ± 9.6 U/l in the subgroup of liver cirrhosis of Child's class A, 37.1 ± 16.9 U/l in the subgroup of liver cirrhosis of Child's class B, 34 ± 13.1 U/l in the subgroup of liver cirrhosis of Child's class C, 69 ± 49.1 U/l in the early HCC group, and 71.5 ± 25.8 U/l in the advanced HCC group [Table 2]. 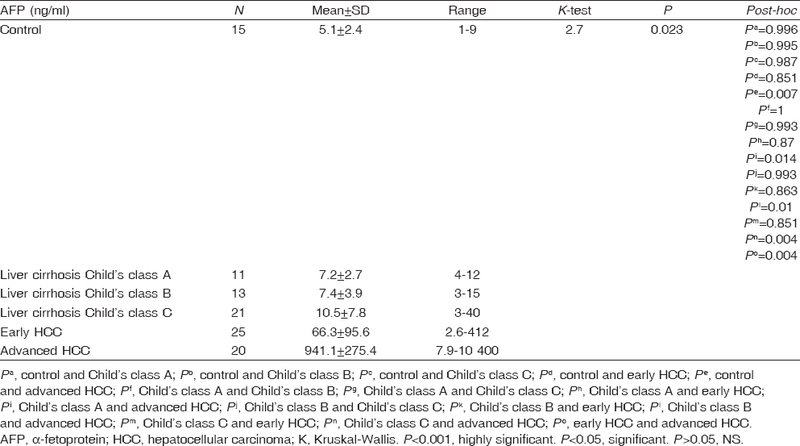 These results showed that the mean ALT was highly significantly higher in both the early and the advanced HCC group compared with the mean ALT in the control group and the subgroups of liver cirrhosis of Child's class B and Child's class C. The mean ALT was significantly higher in both the early and the advanced HCC group than in the subgroup of liver cirrhosis of Child's class A. There was no significant difference between the early and the advanced HCC group as regards ALT. The mean serum AST in the studied groups was as follows: 21.9 ± 12.8 U/l in the control group, 37.1 ± 10.7 U/l in the subgroup of liver cirrhosis of Child's class A, 36.3 ± 16.1 U/l in the subgroup of liver cirrhosis of Child's class B, 38.5 ± 12.9 U/l in the subgroup of liver cirrhosis of Child's class C, 81.8 ± 46.1 U/l in the early HCC group, and 76.5 ± 23.1 U/l in the advanced HCC group [Table 2]. These results showed that the mean AST was highly significantly higher in both groups of early HCC and advanced HCC than all other groups, and there was no significant difference between the early and the advanced HCC group as regards AST. The mean serum bilirubin in the studied groups was as follows: 0.9 ± 0.1 mg/dl in the control group, 1.1 ± 0.2 mg/dl in the subgroup of liver cirrhosis of Child's class A, 1.4 ± 0.5 mg/dl in the subgroup of liver cirrhosis of Child's class B, 3.1 ± 2.1 mg/dl in the subgroup of liver cirrhosis of Child's class C, 1.01 ± 0.3 mg/dl in the early HCC group, and 4.8 ± 2.2 mg/dl in the advanced HCC group [Table 3]. These results showed that the mean serum bilirubin was highly significantly higher in the advanced HCC group than in all other groups. The mean serum bilirubin was highly significantly higher in the subgroup of liver cirrhosis of Child's class C than in the early HCC group. There was no significant difference between the early HCC group and the control group. Moreover, there was no significant difference between the early HCC and the subgroups of liver cirrhosis of Child's class A and Child's class B as regards serum bilirubin. The mean serum albumin in the studied groups was as follows: 4 ± 0.4 g/dl in the control group, 3.8 ± 0.4 g/dl in the subgroup of liver cirrhosis of Child's class A, 2.6 ± 0.2 g/dl in the subgroup of liver cirrhosis of Child's class B, 2.2 ± 0.2 g/dl in the subgroup of liver cirrhosis of Child's class C, 3.7 ± 0.5 g/dl in the early HCC group, and 2.3 ± 0.3 g/dl in the advanced HCC group [Table 3]. These results showed that the mean serum albumin was highly significantly lower in the advanced HCC group than in the subgroup of liver cirrhosis of Child's class A, the early HCC group, and the control group. The mean serum albumin was significantly lower in the advanced HCC group than in the subgroup of liver cirrhosis of Child's class B. The mean serum albumin was highly significantly lower in the subgroups of liver cirrhosis of Child's class B and Child's class C than in the early HCC group. There was no significant difference between the advanced HCC group and the subgroup of liver cirrhosis of Child's class C as regards serum albumin. The mean international normalized ratio (INR) in the studied groups was as follows: 1.05 ± 0.04 in the control group, 1.3 ± 0.4 in the subgroup of liver cirrhosis of Child's class A, 1.6 ± 0.4 in the subgroup of liver cirrhosis of Child's class B, 2 ± 0.3 in the subgroup of liver cirrhosis of Child's class C, 1.1 ± 0.1 in the early HCC group, and 2.3 ± 0.7 in the advanced HCC group [Table 3]. These results showed that the mean INR was highly significantly prolonged in the advanced HCC group than in the control group, the subgroups of liver cirrhosis of Child's class A and Child's class B, and the early HCC group. The mean INR was significantly prolonged in the advanced HCC group than in the subgroups of liver cirrhosis of Child's class C. The mean INR was highly significantly prolonged in the subgroups of Child's class B and Child's class C than in the early HCC group. There was no significant difference between the early HCC group and the control group and the subgroup of liver cirrhosis of Child's class A. The mean serum AFP in the studied groups was as follows: 5.1 ± 2.4 ng/ml in the control group, 7.2 ± 2.7 ng/ml in the subgroup of liver cirrhosis of Child's class A, 7.4 ± 3.9 ng/ml in the subgroup of liver cirrhosis of Child's class B, 10.5 ± 7.8 ng/ml in the subgroup of liver cirrhosis of Child's class C, 66.3 ± 95.6 ng/ml in the early HCC group, and 941.1 ± 275.4 ng/ml in the advanced HCC group [Table 4]. These results showed that the mean serum AFP was significantly higher in the advanced HCC group than in all other groups, but there was no significant difference between the early HCC group and liver cirrhosis group regardless of Child's classification and the control group as regards serum AFP. The mean serum L1CAM in the studied groups was as follows: 17.4 ± 4.6 pg/ml in the control group, 37.2 ± 4.4 pg/ml in the subgroup of liver cirrhosis of Child's class A, 40.7 ± 7.5 pg/ml in the subgroup of liver cirrhosis of Child's class B, 37.7 ± 29.7 pg/ml in the subgroup of liver cirrhosis of Child's class C, 146 ± 29.7 pg/ml in the early HCC group, and 146.8 ± 18 pg/ml in the advanced HCC group [Table 5]. These results showed that the mean serum L1CAM was highly significantly higher in both the early HCC and the advanced HCC group than in all other groups, and there was no significant difference between the early and advanced HCC groups. Biopsies taken from hepatic tumor tissue revealed that the expression of L1CAM was positive in 22 (88%) patients and negative in three (12%) patients [Table 6], and the mean H-score of L1CAM expression in tumor tissue was 145.9 ± 63.1 [Table 7] and [Figure 1], [Figure 2], [Figure 3], [Figure 4], [Figure 5], [Figure 6]. However, biopsies obtained from adjacent cirrhotic tissues revealed that the expression of L1CAM was positive in 20 (80%) patients and negative in five (20%) patients [Table 6] and the mean H-score of L1CAM expression in adjacent cirrhotic tissue was 78.5 ± 38.1 [Table 7] and [Figure 7], [Figure 8], [Figure 9], [Figure 10]. These results showed that no significant difference was found between hepatic tumor and adjacent cirrhotic tissue as regards the expression of tissue L1CAM, but the mean H-score of L1CAM expression was highly significantly higher in tumor than in adjacent cirrhotic tissue. 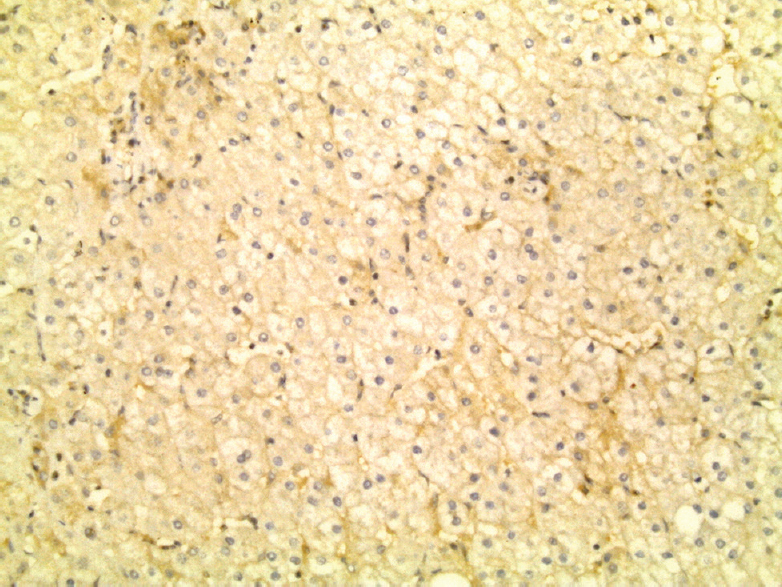 Figure 1: A case of grade II hepatocellular carcinoma showing positive strong L1 cell adhesion molecule expression. Immunoperoxidase, ×200. Figure 2: High-power view of the previous case demonstrating the brown cytoplasmic L1 cell adhesion molecule staining. Immunoperoxidase, ×400. 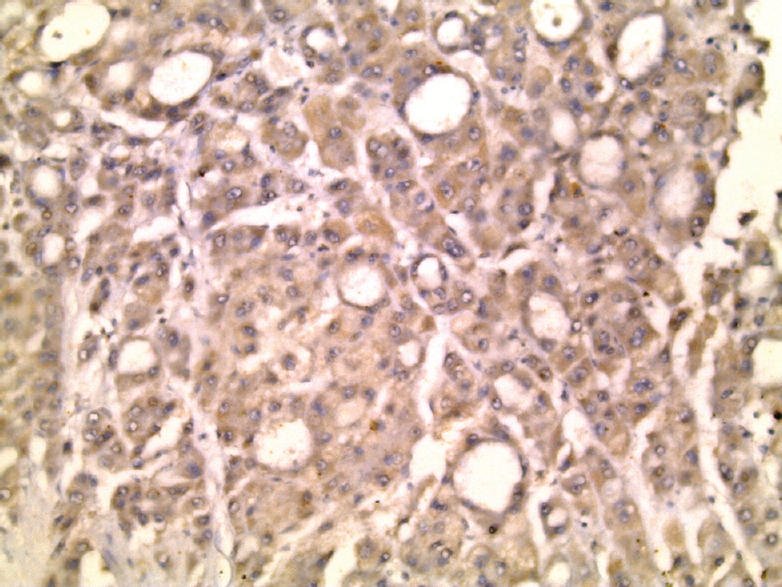 Figure 3: A case of grade III hepatocellular carcinoma showing positive strong L1 cell adhesion molecule expression in some areas of the tumor. Immunoperoxidase, ×200. Figure 4: High-power view of the previous slide showing the strong brown cytoplasmic L1 cell adhesion molecule staining. Immunoperoxidase, ×400. 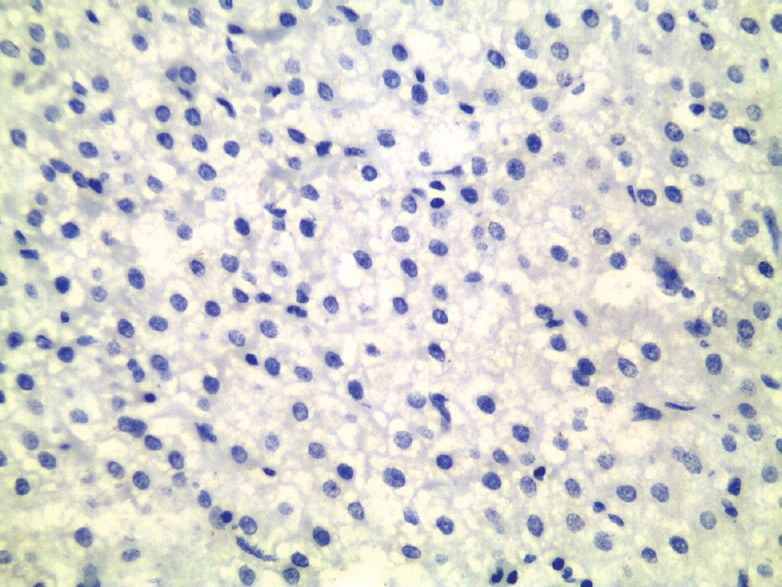 Figure 5: Another area of the same case showing positive moderate L1 cell adhesion molecule expression. Immunoperoxidase, ×200. 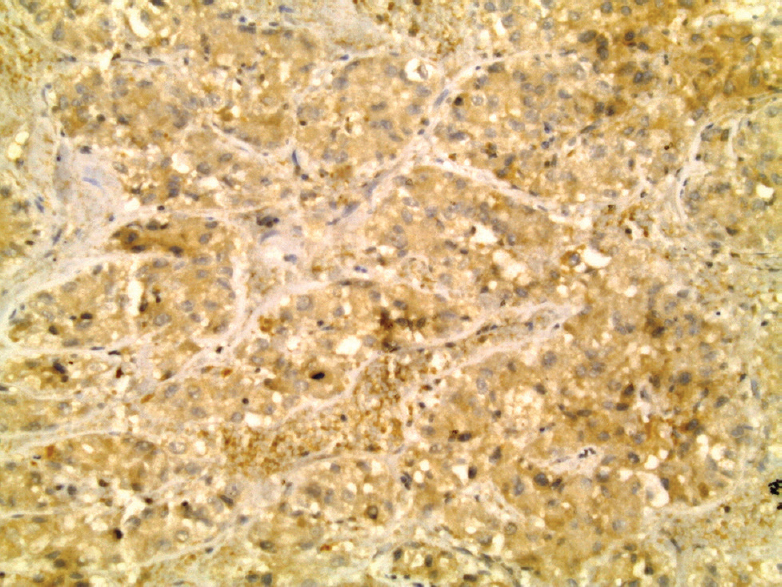 Figure 6: High-power view of the previous slide showing the moderate brown cytoplasmic L1 cell adhesion molecule staining. Immunoperoxidase, ×400. 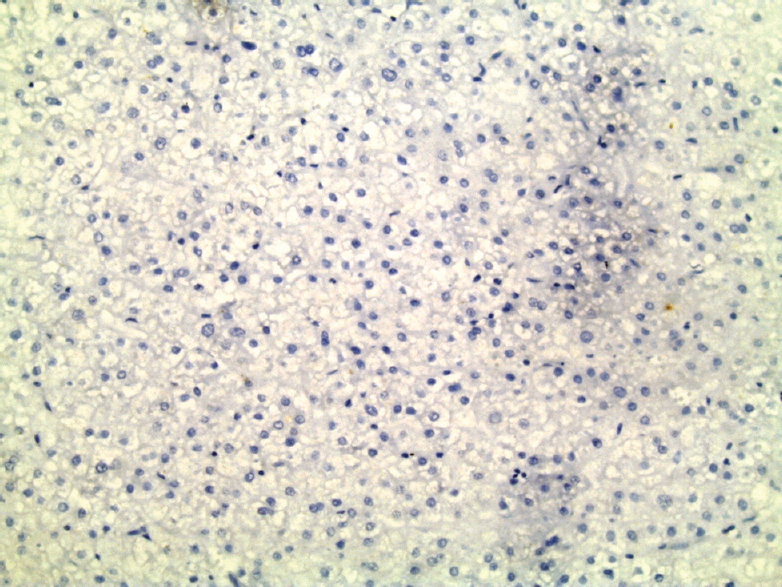 Figure 7: Adjacent cirrhotic tissue showing positive mild L1 cell adhesion molecule expression. Immunoperoxidase, ×100. Figure 8: A higher power view of the previous slide showing the membranocytoplasmic pattern of L1 cell adhesion molecule staining. Immunoperoxidase, ×200. 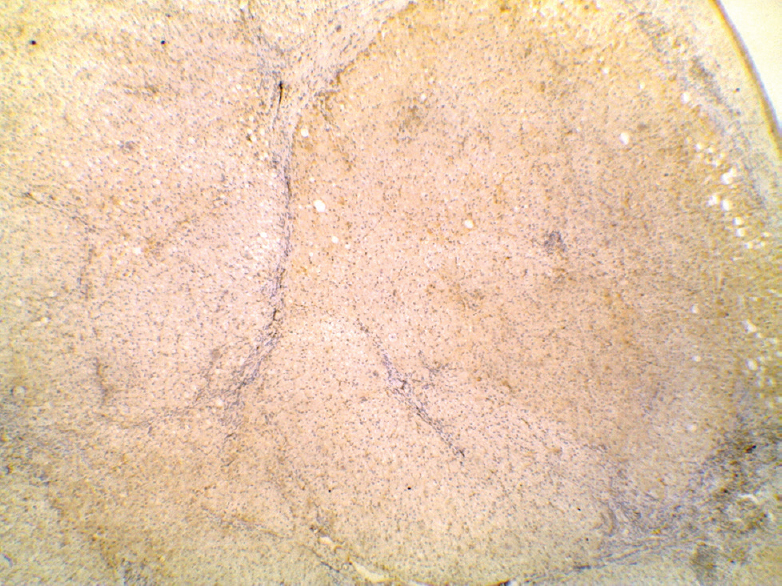 Figure 9: Adjacent cirrhotic tissue of the same case showing negative L1 cell adhesion molecule expression. Immunoperoxidase, ×200. Figure 10: High-power view of the previous slide showing completely absent brown L1 cell adhesion molecule staining. Immunoperoxidase, ×400. 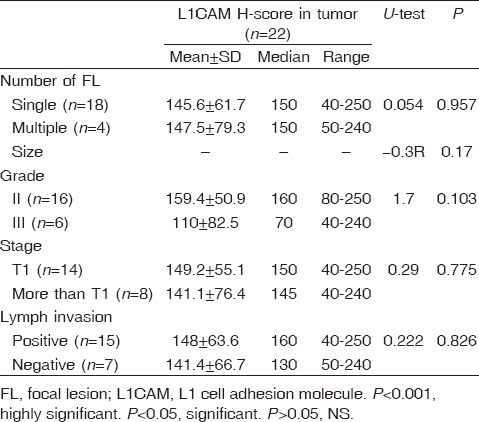 On comparison between H-score of L1CAM expression in tumor tissue and pathological characteristics of tumor [Table 8], this study revealed that there was no significant correlation between H-score of L1CAM expression and number of hepatic focal lesions, size of tumor, grade of tumor, stage of tumor, or lymphovascular invasion. HCC is one of the most common malignant tumors, ranking the fifth in global malignant tumor incidence and the third in cancer-related cause of death, resulting in more than 600 000 deaths per year worldwide . In Egypt, HCV is the main risk factor for HCC, wherein 71% of the HCC cases are positive for anti-HCV antibodies . The Egyptian Ministry of Health estimated that the incidence of HCV infection among Egyptians is 6.9/100 000 persons per year . The incidence of HCC increases progressively with age, although this varies by country. Thus, in high-incidence countries, the mean age at the time of diagnosis was in the third decade of life, and in low-incidence countries, it was two to three decades later . In this study, the mean age was significantly higher in the liver cirrhosis group (58.7 ± 6.2) and the advanced HCC group (59.4 ± 5.1) than in the early HCC group (52.8 ± 5.4), and there was no significant difference between the advanced HCC group (59.4 ± 5.1) and the liver cirrhosis group (58.7 ± 6.2). These results were close to those by Khayyal et al. , who reported that the mean age was 57 years in the cirrhotic group and 58 years in the HCC group. In a retrospective study that included 288 patients of untreated HCC who attended Tanta Cancer Center between 1999 and 2007, the mean ± SD of age was 59.9 ± 11.0 . Shaker et al. found that the most frequent age category affected by HCC in Egypt was between 51 and 60 years. Our results showed that liver cirrhosis and HCC are highly prevalent in male population. The liver cirrhosis group included 71.1% male and 28.9% female patients; the early HCC group included 80% male and 20% female patients, and the advanced HCC group included 75% male and 25% female patients. Our results are in agreement with those of Alswat et al. and Holah et al. , who reported that the male-to-female ratio in HCC patients was 3:1 and 5:1, respectively. Baghdady et al. reported that, among HCC patients, 60% were male and 40% were female. 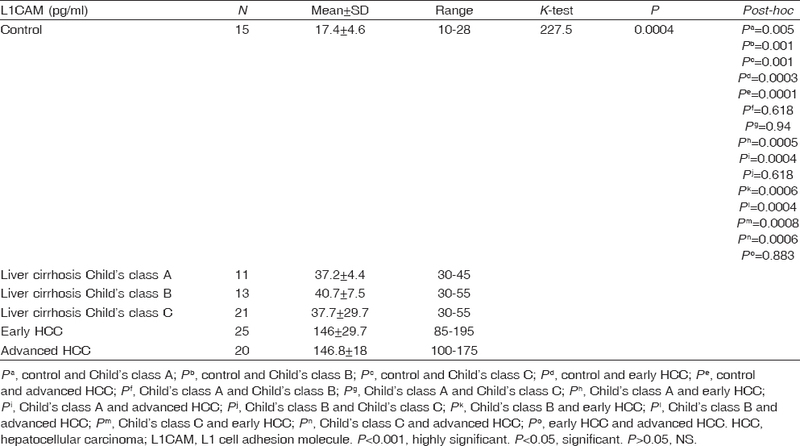 In this study, the mean ALT was significantly higher in both the early HCC group and the advanced HCC group than in the subgroup of Child's class A, and it was highly significantly higher in both the early HCC group and the advanced HCC group than in the control group and the subgroups of Child's class B and Child's class C. The mean AST was highly significantly higher in the HCC group than in all other groups. This is in agreement with the findings of Baghdady et al. , who reported that the mean serum ALT and AST in the non-HCC group was significantly lower than that in the HCC group. Our results are contradictory to those of Okonkwo et al. , who showed elevated ALT levels in both the HCC and liver cirrhosis groups but higher in cirrhosis (1.38 and 1.46 times the upper limit of normal, respectively). This study showed that serum albumin, bilirubin, and prothrombin had a highly significant difference between the advanced HCC and early HCC groups and between the advanced HCC and non-HCC groups, having higher bilirubin and lower albumin and prolonged prothrombin time in advanced HCC. Our results are in agreement with those of Baghdady et al. , who reported that serum albumin, bilirubin, and the prothrombin time showed a highly significant difference between the HCC and the non-HCC group. This is also in agreement with the findings of Durazo et al. , who stated that HCC patients had significantly higher levels of serum bilirubin, INR, and lower albumin levels compared with non-HCC patients. In contrast to our study, Sarwar et al. reported that there was no significant difference as regards serum albumin and INR between the HCC group and the non-HCC group. This study showed that the mean serum AFP was significantly higher in advanced HCC than in all other groups, but no significant difference was found between the early HCC and the control group and the liver cirrhosis group regardless of Child's classification. These results revealed that the usefulness of serum AFP in the detection of early HCC is limited. This is in agreement with the findings of Singal et al. , who demonstrated that the addition of AFP to ultrasound does not substantially improve the sensitivity of surveillance for early HCC as well as the findings of Murugavel et al. , who showed that AFP positivity in HCV-related HCC was only 17.6%. This study showed that the mean serum L1CAM is highly significantly higher in both the early and advanced HCC groups than in all subgroups of liver cirrhosis regardless of Child's classification and the control group, with no significant difference between the early and advanced HCC groups. In this study, no significant difference was found between hepatic tumor and adjacent cirrhotic tissue as regards positive immunohistochemical expression of L1CAM. On the other hand, tumor tissue showed significantly higher H-scores of L1CAM expression compared with adjacent cirrhotic tissue. Our results are in agreement with those of Guo et al. , who revealed that L1CAM immunostaining in HCC tissues were significantly higher than those in the adjacent non-neoplastic liver tissues. The current study showed that L1CAM H-score was not significantly associated with tumor size, tumor grade, tumor stage, and lymphovascular invasion. In contrast to our results, Guo et al. revealed that L1CAM expression in HCC tissues was significantly associated with advanced tumor grade and advanced tumor stage. The lack of association between our L1CAM H-scores and tumor grade may be attributed to the fact that all studied cases were of grades II and III, which is considered as moderately differentiated tumors, and none of our cases were of grade I (well differentiated) or grade IV (poorly differentiated). Because of its involvement in a wide variety of human cancers, L1CAM has been considered as a target molecule for cancer therapeutics. For example, the study by Bao et al. found that L1CAM is required for maintaining the growth and survival of glioma cells both in vitro and in vivo, and L1CAM may represent a therapeutic target for improving the treatment of malignant gliomas and other brain tumors. Hung et al. reported that targeting L1CAM may be useful in the treatment of advanced oral squamous cell carcinoma. Chen et al. showed that knockdown of L1CAM could improve the responsiveness to treatment of gastric cancer and also inhibit the tumor growth and metastasis of gastric cancer cells in vivo. The contribution of L1CAM to the carcinogenesis can be explained by its function. At first, L1CAM is a target gene of β-catenin T-cell factor signaling, which is an important cancer-related pathway . In addition, L1CAM induces extracellular signal-regulated kinase and its regulated genes, which are associated with cell motility and invasion . Third, L1CAM mediates homophilic binding between cells and heterophilic interactions with various extracellular matrix proteins and their receptors, and hence L1CAM may play a role in cancer promotion and metastasis . The value of L1CAM in HCC needs further evaluation. AFP has low sensitivity in HCC, particularly during the early stages. Serum L1CAM is accurate in differentiating HCC from nonmalignant chronic liver disease. 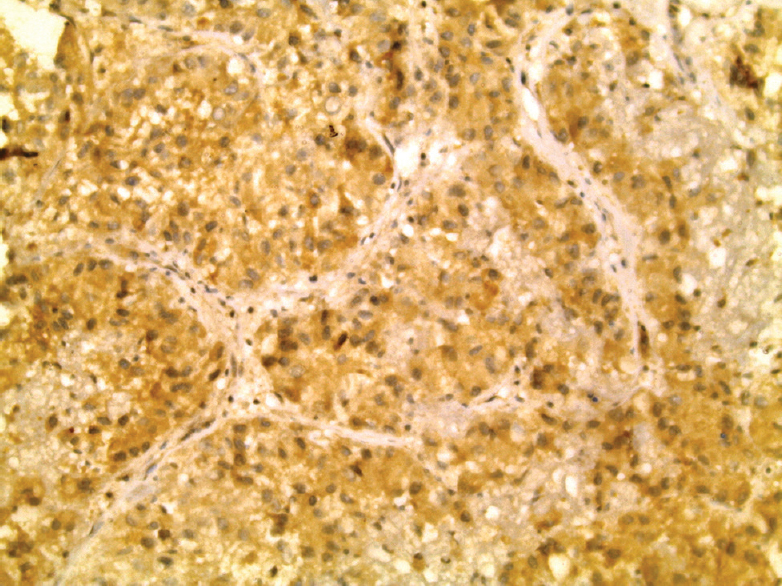 Immunohistochemical expression of L1CAM in tumor tissue is higher than its expression in adjacent cirrhotic tissue, which points to the role of L1CAM in hepatocarcinogenesis and may be considered as a therapeutic target. This study was funded by Menoufia Faculty of Medicine. Rasool M, Rashid S, Arooj M, Ansari SA, Khan KM, Malik A, et al. New possibilities in hepatocellular carcinoma treatment. Anticancer Res 2014; 34:1563–1571. El-Serag HB. 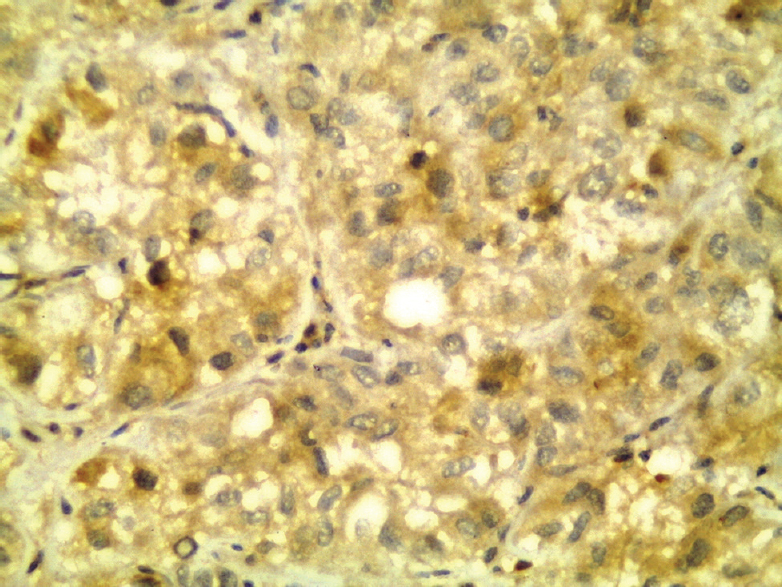 Hepatocellular carcinoma. N Engl J Med 2011; 365:1118–1127. Mittal S, El-Serag HB. Epidemiology of hepatocellular carcinoma: consider the population. J Clin Gastroenterol 2013; 47:S2–S6. El-Zayadi AR, Badran HM, Barakat EM, Attia Mel-D, Shawky S, Mohamed MK, et al. Hepatocellular carcinoma in Egypt: a single center study over a decade. World J Gastroenterol 2005; 11:5193–5198. Omar A, Abou-Alfa GK, Khairy A, Omar H. Risk factors for developing hepatocellular carcinoma in Egypt. Chin Clin Oncol 2013; 2:43. Morsy KH, Hasanain AF, Kobeisy MA. Risk factors of hepatocellular carcinoma: are they the same among cirrhotic and non-cirrhotic patients in Upper Egypt? J Arab Soc Med Res 2011; 6:103–110. Baghdady I, El-Kaffrawy N, Abd EI-Atti E, Abd EI-Bary N, Saber M. Study of the risk factors for hepatocellular carcinoma: effect of their synergism. J Am Sci 2013; 9:211–217. Salgia R, Singal AG. Hepatocellular carcinoma and other liver lesions. Med Clin North Am 2014; 98:103–118. Lund K, Dembinski JL, Solberg N, Urbanucci A, Mills IG, Krauss S. Slug-dependent upregulation of L1CAM is responsible for the increased invasion potential of pancreatic cancer cells following long-term 5-FU treatment. PLoS One 2015; 10:e0123684. Doberstein K, Milde-Langosch K, Bretz NP, Schirmer U, Harari A, Witzel I, et al. L1CAM is expressed in triple-negative breast cancers and is inversely correlated with androgen receptor. BMC Cancer 2014; 14:958. Zhang J, Yang F, Ding Y, Zhen L, Han X, Jiao F, Tang J Overexpression of L1 cell adhesion molecule correlates with aggressive tumor progression of patients with breast cancer and promotes motility of breast cancer cells. Int J Clin Exp Pathol 2015; 8:9240–9247. Wang YY, Li L, Zhao ZS, Wang YX, Ye ZY, Tao HQ. L1 and epithelial cell adhesion molecules associated with gastric cancer progression and prognosis in examination of specimens from 601 patients. J Exp Clin Cancer Res 2013; 32:66. Kenwrick S, Watkins A, De Angelis E. Neural cell recognition molecule L1: relating biological complexity to human disease mutations. Hum Mol Genet 2000; 9:879–886. Bilalovic N, Standstad B, Glouh R, Nesland J, Selak I, Torlakovic E. CD10 protein expression in tumor and stromal cells of malignant melanoma associated with tumor progression. Mod Pathol 2004; 17:1251–1258. Li J, Wang Y, Yu W, Chen J, Luo J. 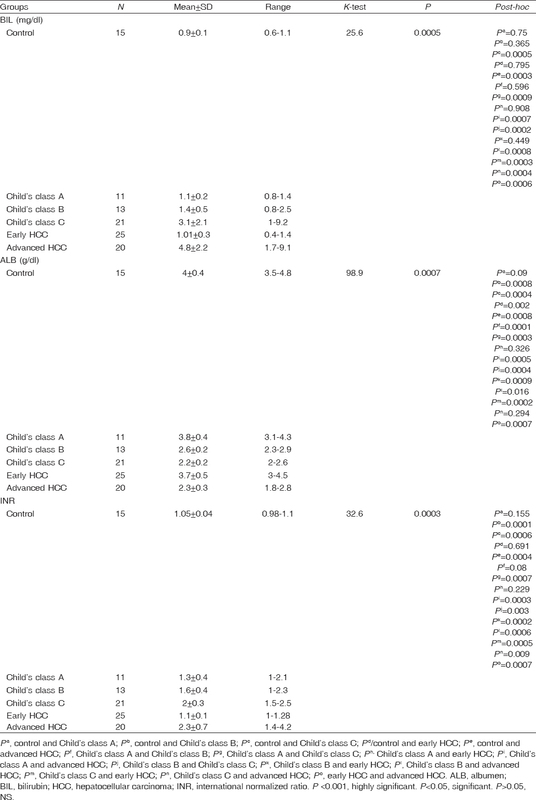 Expression of serum miR-221 in human hepatocellular carcinoma and its prognostic significance. Biochem Biophys Res Commun 2011; 406:70–73. El-Zayadi RA, Abaza H, Shawky S, Mohamed MK, Selim OE, Badran HM. Prevalence and epidemiological features of hepatocellular carcinoma in Egypt: a single center experience. Hepatol Res 2001; 19:170–179. Miller FD, Abu-Raddad LJ. Evidence of intense ongoing endemic transmission of hepatitis C virus in Egypt. Proc Natl Acad Sci USA 2010; 107:14757–14762. Hopf U. The elder patient with advanced liver disease. Schweiz Rundsch Med Prax 2005; 94:743–750. Khayyal AE, Kaysar HH, Darwesh H, Alsherif A, Mohsen M, Salem HM. Evaluation of the role of IL 18 in diagnosis of HCC in critical Egyptian patients with chronic hepatitis C. Nat Sci 2015; 13:32–36. Zeeneldin AA, Salem SE, Darwish AD, El-Gammal MM, Hussein MM, Saadeldin M. Untreated hepatocellular carcinoma in Egypt: outcome and prognostic factors. J Hepatocell Carcinoma 2015; 2:3–9. Alswat KA, Sanai FM, Altuwaijri M, Albenmousa A, Almadi M, Al-Hamoudi WK, et al. Clinical characteristics of patients with hepatocellular carcinoma in a middle eastern population. Hepat Mon 2013; 13:e7612. Holah NS, El-Azabb DS, Aiad HA, Sweed DM. Hepatocellular carcinoma in Egypt: epidemiological and histopathological properties. Menouf Med J 2015; 28:718–724. Baghdady I, Fouad F, Sayed M, Shoaib A, Salah Y, Elshayeb E, et al. Serum markers for the early detection of hepatocellular carcinoma in patients with chronic viral hepatitis C infection. Menouf Med J 2014; 27:544–550. Okonkwo UC, Nwosu MN, Nnadozie OJ, Mamah VV, Nsoedo CW. Is liver function test of any diagnostic relevance in patients presenting with hepatocellular carcinoma? Orient J Med 2011; 23:1–4. Durazo FA, Blatt LM, Corey WG, Lin J-H, Han S, Saab S, et al. Des-gamma-carboxyprothrombin, alpha-fetoprotein and AFP-L3 in patients with chronic hepatitis, cirrhosis and hepatocellular carcinoma. J Gastroenterol Hepatol 2008; 23:1541–1548. Sarwar S, Khan AA, Tarique S. Validity of alpha fetoprotein for diagnosis of hepatocellular carcinoma in cirrhosis. J Coll Physicians Surg Pak 2014; 24:18–22. Singal A, Volk ML, Waljee A, Salgia R, Higgins P, Rogers MA, Marrero JA. Meta-analysis: surveillance with ultrasound for early-stage hepatocellular carcinoma in patients with cirrhosis. Aliment Pharmacol Ther 2009; 30:37–47. Murugavel KG, Mathews S, Jayanthi V, Shanker EM, Hari R, Surendran R, et al. Alpha-fetoprotein as a tumor marker in hepatocellular carcinoma: investigations in south Indian subjects with hepatotropic virus and aflatoxin etiologies. Int J Infect Dis 2008; 12:e71–e76. Guo X, Xiong L, Zou L, Sun T, Zhang J, Li H, et al. L1 cell adhesion molecule overexpression in hepatocellular carcinoma associates with advanced tumor progression and poor patient survival. Diagn Pathol 2012; 7:96. Bao S, Wu Q, Li Z, Sathornsumetee S, McLendon RE, Hjelmeland AB, et al. Targeting cancer stem cells through L1CAM suppresses glioma growth. Cancer Res 2008; 68:6043–6048. Hung SC, Wu IH, Hsue SS, Liao CH, Wang HC, Chuang PH, et al. Targeting L1 cell adhesion molecule using lentivirus-mediated short hairpin RNA interference reverses aggressiveness of oral squamous cell carcinoma. Mol Pharm 2010; 7:2312–2323. Chen D-L, Zeng Z-L, Yang J, Ren C, Wang D-S, Wu W-J, Xu RH. L1cam promotes tumor progression and metastasis and is an independent unfavorable prognostic factor in gastric cancer. J Hematol Oncol 2013; 6:43. Tsutsumi S, Morohashi S, Kudo Y, Akasaka H, Ogasawara H, Ono M. L1 cell adhesion molecule (L1CAM) expression at the cancer invasive front is a novel prognostic marker of pancreatic ductal adenocarcinoma. J Surg Oncol 2011; 103:669–673. Villedieu M, Deslandes E, Duval M. Acquisition of chemoresistance following discontinuous exposures to cisplatin is associated in ovarian carcinoma cells with progressive alteration of FAK, ERK and p38 activation in response to treatment. Gynecol Oncol 2006; 101:507–519. Raveh S, Gavert N, Ben-Ze'ev A. L1 cell adhesion molecule (L1CAM) in invasive tumors. Cancer Lett 2009; 282:137–145.